Smartphone is all fun due to the vast freedom we enjoy in it, It is easy to use and having a wide range of features.But the most important thing is that our smartphones have become the secret keepers of our personal and professional life. Whether it be personal photos, videos, contacts, financial information or business emails and files, you cannot risk losing any information to an outsider at any cost. So if you want to sell your old device as you are interested in buying a new one, or probably exchanging a better one. Then before giving away your phone, it is a must that you remove all the accounts, passwords, and all the user data. Performing only a factory reset on the phone might be a good idea to solving some of the problems but not a foolproof one as information saved in your iPhone can still be traced and sometimes recovered if the other person is having some technical knowledge. Now tap on “Delete All Content and Settings” on iPhone. Go into your iPhone Settings menu — Settings > iCloud. Tap the main Settings icon and select General on the resulting menu. Tap the Reset button at the bottom of the resulting page. Tap the Blue “Erase All Content and Settings” option just near the top, followed by the Red Erase iPhone option in the resulting pop-up window to confirm your decision. Above three methods are used very commonly to Erase data from iPhone and iDevices, data means contents and setting, But these are not the safest way to Prevent your private data stored in old phones from being recovered and stolen again after selling.Because all The deleted files and other important personal data still exist in iPhone and they can be recovered by some ios data recovery software later.So now you know that simple delete operation and factory reset options are not enough to Prevent your private data stored in old phones from being recovered and stolen again after selling.So now i am sharing two best third-party tool that can help you to permanently erase deleted data on iPhone, including photos, videos, contacts, text messages, Apple ID and other personal information, and the best thing is that no data recovery software can restore them back. I found iOS Data Eraser tool on top in most of the forum and blogs to erase data permanently and when i personally used it i was amazed with its features and speed.The program iOS Data Eraser offers 4 erasing option for your different demands: “EXPRESS CLEANUP”, “ERASE PRIVATE Data”, “ERASE DELETED FILES” and “ERASE ALL DATA”. 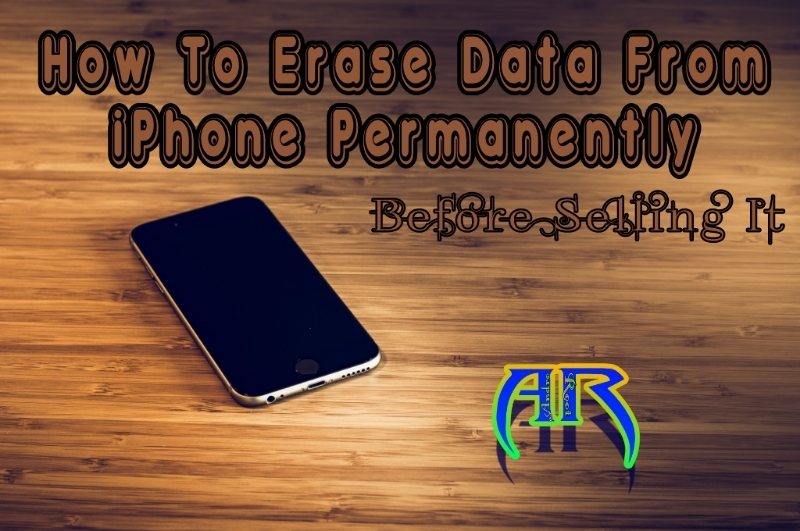 and when you choose Last two options to erase data,then it can Erase Everything Permanently and Prevent your private data stored in old phones from being recovered and stolen again after selling.iOS Data Eraser is a ultimate tool to wipe all data from iPhone,iPad,iPod and Android devices permanently,in order to avoid personal privacy is exposed. Fully compatible with iOS 10, and support iPhone 7/7 Plus, iPhone 6S/6 Plus,etc. Download and Install iPhone Data Eraser software from the given link. On the next window you have to Select Right Erasing Option from the 4 erasing options According to your need which are “EXPRESS CLEANUP”, “ERASE PRIVATE Data”, “ERASE DELETED FILES” and “ERASE ALL DATA”. You can select the appropriate option and give it a try. As we want to Permanently erase everything stored on the iPhone, so Select Erase All Data from the sidebar, which leads to the next step. Start Erasing All Data on iPhone by selecting ‘delete ‘ and click Start Button to confirm that you are going to erase all the data on the iPhone. Caution: This action will PERMANENTLY erase data from iPhone or iDevices and can NOT be undone, please make sure you’ve backed up the data in case of any data loss. Click here to try iOS Data Eraser Tool and know more about it. When I was searching for some of the best tools, That can Erase Data from iPhone Permanently, I found Wondershare’s cool product “Wondershare SafeEraser”, It is designed to protect your private information, It is an all in one phone eraser tool to clean your iPhone iPad and Android devices data.Wondershare SafeEraser works on both Windows and Mac OS X, including Windows XP, Vista, 7, 8, 8.1 and Windows 10. Mac OS X 10.6 ~ 10.11.So you can give this amazing product a try. Connect iPhone or iPad to computer. If this is the first time you connect to the computer, you need to Trust the computer firstly. Click Erase All Data button, in the next window you will be asked to type ‘delete’ into the box to confirm. Click Erase Now button to erase all data on your device. Click Erase Deleted Files button, then SafeEraser will start to scan the device and list all of the deleted files. This process would take several minutes. After the scanning process is finished, SafeEraser will list all the files. You can click to preview them. Tick the box of the file type to choose them to delete. Normally SafeEraser will choose them all. Click Erase Now button to erase the deleted files. you don’t have to worry about your privacy or data of old smartphone.